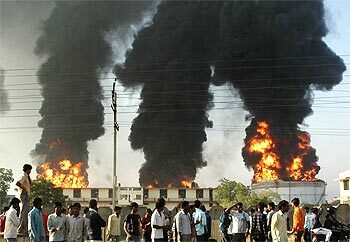 The toll in the fire at Indian Oil Corporation's fuel depot outside Jaipur may rise to nine, as six missing employees are now feared dead, even as fire fighters and the Army worked to contain the blaze that has burnt nearly Rs 150 crore worth of auto fuel. "Three civilians are confirmed dead and one is seriously injured. Six of our staff -- three officers and three blue collared employees -- are missing," said IOC Chairman Sarthak Behuria, who visited the accident site on Friday morning. Five civilians were seriously injured while 40 others sustained minor injuries. The injured were admitted to various hospitals in the city and are undergoing medical treatment. There were nine IOC employees and one Bharat Petroleum Corporation Ltd employee at the tank farm, which had a capacity to store 1,00,000 kilolitres of petrol, diesel and kerosene in 13 tanks, when the fire broke out at 7.30 pm on Thursday. Nearly 50,000 kilo-litre of fuel, mostly diesel, caught fire due to a pipeline leak at one of the tanks that stored petrol after the daily routine of loading products in tank trucks ended. 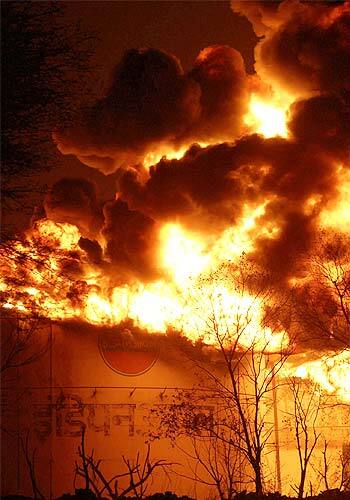 Three IOC staffers and the lone BPCL employee managed to escape while six were trapped in the fire and are now feared dead. "The fire continues to rage in 4-5 tanks, where the product is being allowed to burn under controlled conditions, so that the intensity of the fire and the damage it is likely to cause gets minimised," Behuria said. "We estimate that the stock will burn out by today evening and firefighters will be able to enter the site by early Saturday morning," Behuria said. 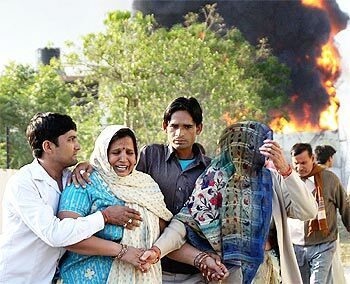 Union Oil Minister Murli Deora, who flew to Jaipur early today, said that the IOC will give an ex-gratia of Rs 10 lakh to the family members of those killed, Rs 2 lakh to the seriously injured and Rs 1 lakh to those with minor injuries. "This is besides the compensation announced by the Rajasthan government," he said. Deora ordered an inquiry into the accident, to be conducted by a five-member committee headed by M B Lal, former chairman and managing director, HPCL. The committee, which also has the executive director of the Oil Industry Safety Directorate as member secretary, will submit its report in six weeks. The terminal supplied petroleum products to Jaipur city and adjacent markets in Rajasthan. IOC has made arrangements to maintain normal supplies of petroleum products in the areas fed by the affected depot, from its nearest bulk storage points in Ajmer and Bharatpur, and through HPCL's terminal at Bangur. "About Rs 140-150 crore worth of fuel was stocked at the depot at the time of the fire," IOC Director (Planning and Business Development) B M Bansal said, adding that the product was covered by insurance. Black clouds of smoke continue to billow and could be seen from a distance of ten km on the Jaipur-Tonk highway. Bansal said the Jaipur terminal is an automated terminal and equipped with state-of-the-art safety and fire-fighting gadgets. "However, the magnitude of the fire was too huge to be controlled with the available equipment," he said.